Tillamook is a beloved 108-year-old cooperative of nearly 100 family dairy farms based in the Pacific Northwest of America. By building on the values of the company and adopting a challenger strategy, President and CEO Patrick Criteser has seen revenues grow 70% and profits increase 3x over the last five years. We interview Patrick to hear the insight behind the “Dairy Done Right” brand platform and the impact it has had on the entire business. What was the situation before you arrived in 2012? At the time, and it is true today, we were the number one selling brand in any food and beverage category, in the Pacific Northwest. So, we were a high penetration, high loyalty brand, in a small part of the US. People had grown up with Tillamook and would appreciate the quality, but that was the extent of the brand identity at that time, it was thought of almost like a heritage brand. What did you feel was the opportunity for the business? There was some aspiration for growth from the shareholders, but it was mostly tied to creating stability in order to help weather global volatility in the dairy markets. When I came in to interview for CEO in early 2012, I told the board this business should be two or three times the size it is today, but to make that happen, we were going to have to pursue a bolder vision for the company. What was the insight that led to that bigger and bolder vision and identity? Our origin story was an inspiration for us. In the 1800s, our farmers were raising cows, making milk and cheese and then taking it on boats around the coastal range to sell at markets. So our mission has always been about connecting farmers and consumers. In an industrialized, highly segmented food supply chain, we thought that could be quite a unique offering to consumers. Why challenge the industrialized food supply chain? US consumers spend a smaller percentage of their income on food than anywhere else in the world. But, the value-engineered-food they're getting for that is creating epidemic food related diseases. Consumers may think they want lower, lower prices, and retailers may think they want lower, lower prices but it’s not serving the consumer well, and not serving the environment well. How did you transition from that concept of challenging the industrialized food supply chain into the creation of the new brand identity? The identity evolved simultaneously with the marketing effort. We found confidence in feeling there was a unique role for us to play in the market and 72andSunny helped us clarify it. We joked around, after 100 years, we were on trend; people want to know where their food comes from. We wanted consumers to think differently about dairy, just like they were with their meat. What was the initial marketing campaign that brought this to life? We launched 'Dairy Done Right' as our first effort behind this stronger, bolder, more challenger oriented voice with the consumer. We thought if we show cows and fields etc, it’s going to look the same as everything else and no one is going to notice. So the essence was to look different, sound different and draw out the contrast between industrialized food and what we were offering. What impact did 'Dairy Done Right' have on the culture? People were proud when they saw the campaign and it really helped convince folks that we could grow the business aggressively, and compete with better resourced, large multinationals. 'Done Right' also became a phrase used internally. Whether it was 'Product development Done Right' or, 'IT Done Right'. We didn't push that, it just happened. It really took off internally. What about the impact elsewhere in the business? We now use 'Dairy Done Right' as a screen for new product development. It’s helped grow our business through moving into new categories like Greek yoghurt and premium ice-cream. We've also reformulated very popular products and actually pulled a sour cream off the shelf because we felt they weren't up to our standards and weren't consistent with the brand. Has the strategy changed in terms of geographic distribution? One of the first things we did in when we were resetting the strategy in 2013 is we constrained our geographic reach. So, we focused our capabilities and trading area to the Western United States, West of the Rockies and Texas. When we’ve had offers from retailers to expand further, we’ve respectfully declined until we've felt ready to pursue more geographic expansion. 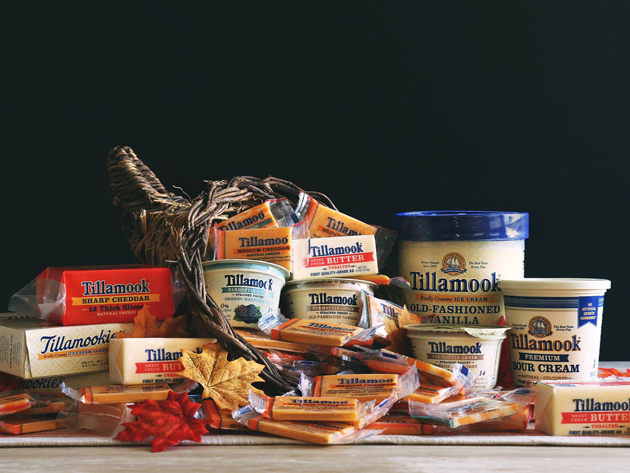 What have been the key benefits from Tillamook adopting a more challenger orientated position? Having a clear view on who we are and what we stand for, has kept us from just chasing trends that are happening, and instead stay true to ourselves. It's also enabled us to be bolder and more provocative than we would have been otherwise. In our 'Goodbye Big Food. Hello Real Food' campaign, we were literally blowing up competitors’ products and lighting them on fire. What was the impact on revenues? How is the business doing? We’ve seen 70% growth in revenue in the last five years. With a three times increase in profitability, and a similar increase in the distributions to the farmers who own the business. And 1.3 million people visited our factory in Tillamook last year, which is a little out of the way, so they took some effort to get there. A big thank you to Patrick for his wisdom and time and to Bord Bia for kindly letting us use their space to film.